This past weekend was initially just going to be a wash. Work has been crazy hectic lately, so I've been using the weekends to recover. And by recover, what I really mean is watch an insane amount of Netflix and spend hours on Pinterest and Tumblr. I'd even decided to give myself a little bit of a baking break, pulling on my polka dotted stretchy pants from Uniqlo and parking myself in front of the TV with my iPad in one hand and my phone in the other. Ahhh, the good life. Halfway through an episode of My Cat From Hell (which, by the way, is the best show ever), I picked up my phone to idly scroll through my Instagram feed when — BAM — I spotted Melissa's pretty donut pictures on Instagram (which, by the way, if you guys aren't following Melissa on Instagram, you are seriously missing out). Whoa, I thought to myself, after being hypnotized by her beautiful picture of a chocolate and vanilla donut checkerboard. Now I kinda want a donut. I wish I lived in the same city as Melissa. Maybe she'd bring me donuts. Well... I could also probably go get a donut... but that would require getting up and changing out of my stretchy pants. And I also want to find out if Jackson manages to tame City the Kitty (a beautiful Bengal cat with a propensity to leap at its poor owner's head). Just as I had decided that it was probably a good idea to bike a few blocks to check out the newly opened Blue Star Donuts after the episode, my phone buzzed again. Lo and behold, it was Melissa herself, emailing to ask if I was doing a post for this week's upcoming National Donut Day. I paused. I hadn't been planning on it, but I did have a donut craving and an afternoon clear of any plans (well, except for binge watching My Cat From Hell). What if I skipped the long lines at Blue Star and made the donuts myself? As for topping the donuts, I played two different cards, with one hand being more successful than the other. The winner was simple: I glazed half of the donuts with Nutella, leftover from the day I made this Nutella swirled brioche, and topped with some raspberry sprinkles left over from my last trip to the Netherlands. 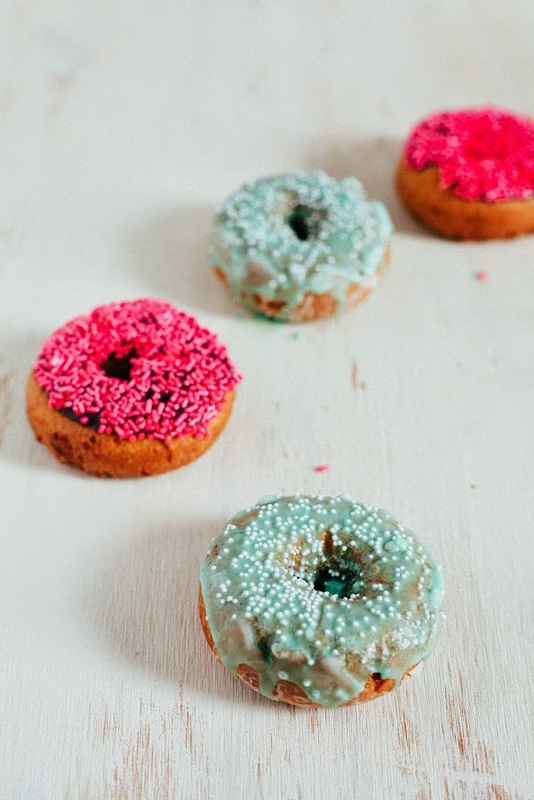 The other half of the donuts were glazed with a classic powdered sugar glaze with a pinch of blue Kool Aid to give them their color and a tangy kick. It was actually pretty good (and reminded me of Voodoo Doughnut's Miami Vice Berry donut), but nothing can really beat Nutella. I know, I know, it's crazy that I happened to have both raspberry sprinkles and blue Kool Aid in my pantry. But I'm really into experimenting with crazy ingredients, and when I see them on the grocery store shelves, I can't help but buy them for "future projects". Most of the time, they do end up just sitting in my pantry languishing (lucky for me both sprinkles and Kool Aid have an insane shelf life... yay? 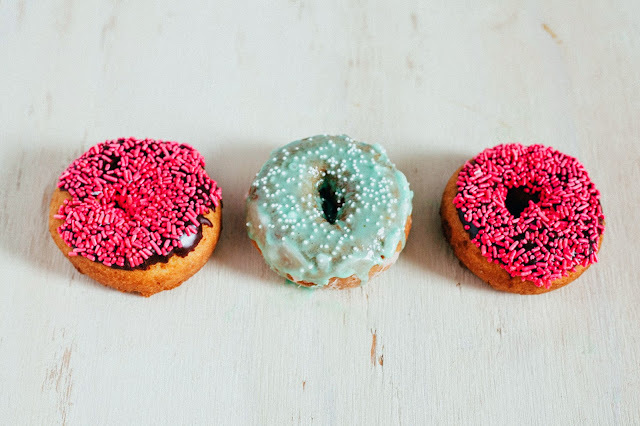 ), but then again, there are days like today when a blogger friend calls on you to make donuts and you go ahead and do so and top them with said crazy ingredients. No donut cutter? No problem! In a pinch, use a drinking glass with a 3-inch diameter to cut out donuts and a regular old shot glass to cut out the donut holes. In a medium bowl, whisk together 1 1/4 cup all-purpose flour, 1 teaspoon baking soda, 1 teaspoon cinnamon and 1/4 teaspoon kosher salt. Set aside. In a separate medium bowl, whisk together 1/3 cup granulated sugar, 1/4 cup sour cream, 1 large egg and 1 tablespoon unsalted butter until smooth. Add the flour mixture (from the 1st step) a little at a time until a smooth dough forms. Cover the bowl with plastic wrap and refrigerate the batter for 15 to 20 minutes. After the batter has chilled, heat at least 2 inches of oil in a deep fryer or a cast iron skillet until a candy thermometer registers 360 (F). Roll out the dough on a lightly floured surface to 1/2 inch thick. Use a 3 1/2 inch donut cutter to cut out donut holes. With a metal spatula, carefully place 1 or 2 donuts at a time in the oil. Fry for 1 to 2 minutes per side, or until light golden brown. Remove with a slotted spoon and drain on a paper towel on a wire rack. Let cool slightly before glazing. Like most quick breads, the donuts are best on the day they are made. i am completely obsessed with your use of KOOL AID! too cool. Is it bad to leave the house in stretchy pants?! No one told me. The baby on my hip makes up for my appearance half the time. These sound divine, especially the splits and cracks. Also, my cast iron pan is sitting out on the stove. I should probably go warm it up now. Thanks for the instagram love! i LOVE sour cream donuts. they're so much more rich, like you said. and a bit more moist too!! YUM!!! Ohhhh my goodness sour cream donuts. I'm pretty sure I won't be able to think about anything else for the rest of the day. I can just imagine the extra oomph and moist texture it adds to the crumb. (OK, now I'm drooling.) And the blue Kool Aid is -- literally -- the icing on the cake. Now I don't know which donut recipe of yours I want to try first -- this or the malasadas!! Doughnuts are totally one of my biggest weaknesses. A fresh doughnut in the morning - just sets the day for a perfect note! Yours are beautiful; love the colors! 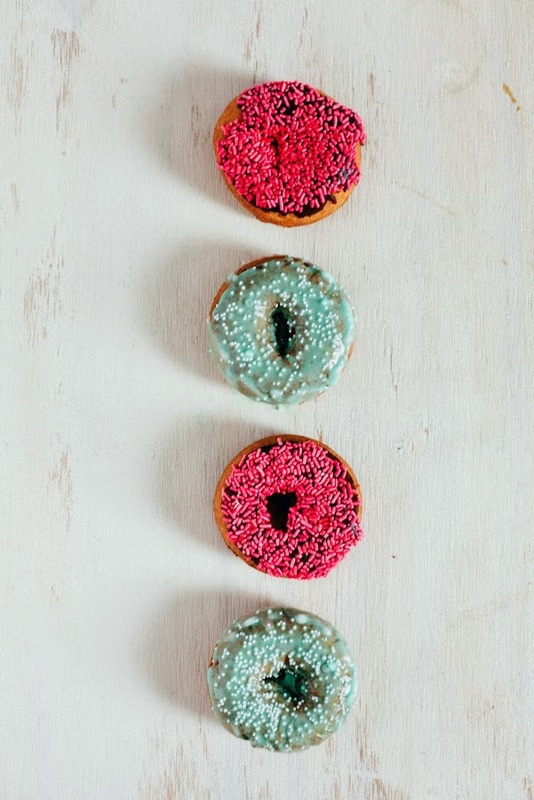 Those look delicious...but I don't know if I should try making my own donuts. I think that may be way too much of a temptation for me! Ha ha! Ok, now I totally have a donut craving. Thanks a lot. I once tried to make them—years and years and years ago, when I was in middle school—and the result was revolting. Maybe it's time I tried them again. SPRINKLES! So it's Melissa who's behind all this donut maddness that's going on right now? Bless her. This post made my day... Michelle, you are hilarious. I'm fascinated by Jackson on "My Cat from Hell" too...I could watch him for hours. I believe strongly that if you call stretchy pants "yoga pants", it is socially acceptable to roam the community in them... I've been doing it for years, and my neighbors still speak to me if I run into them in the grocery store. I do wonder: what else is hiding in your pantry? 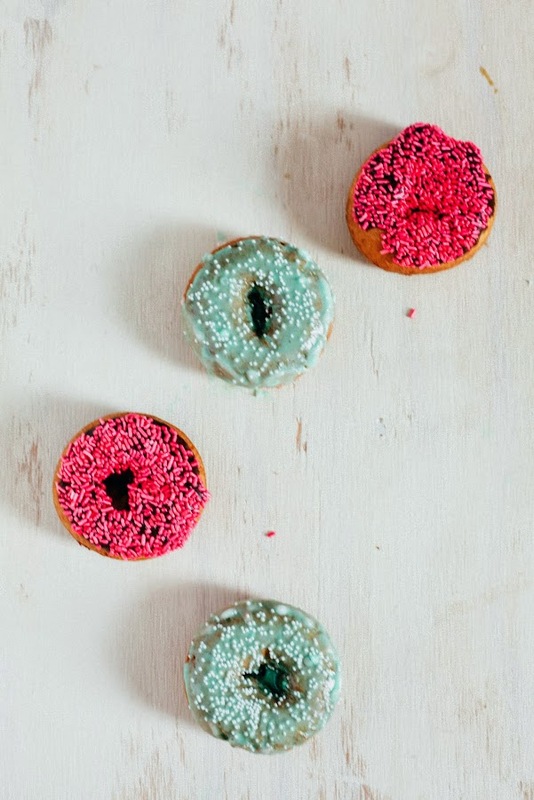 And by the way, thank you for alerting me to the fact that it is National Donut Day. 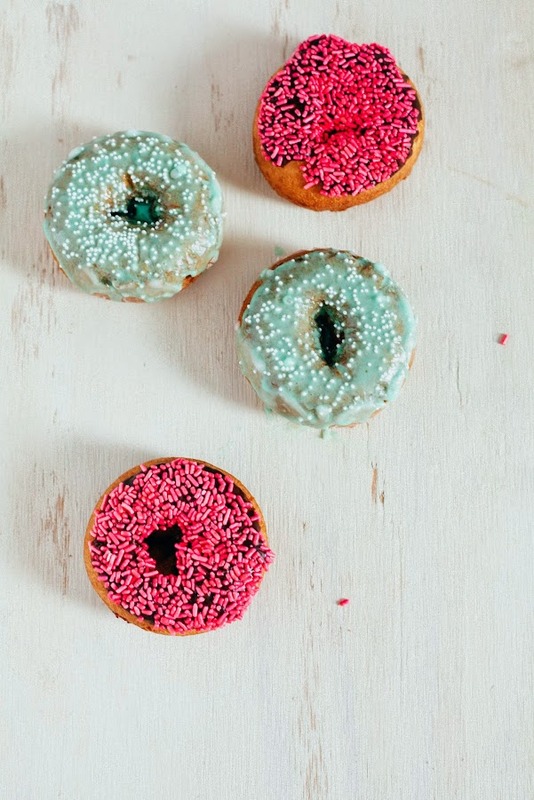 I think that calls for Donuts for dinner to celebrate. Just discovered your blog through searching some combination of "buttercream" and/or "cake" and/or "frosting" and I'm so, so glad I did!! Love all of your posts so far! I need a donut now. NOW! Oh, my! The color in these photos is insanely pretty! The pink and blue reminds me of the flowers that are starting to bloom in my garden right now. And although I have never had a sour cream donut, I must have one right now! All of these colors are so fun! These look so delicious. Thank you for the notes on how to fry if you don't have a deep fryer. Definitely wanting to give these a try!! 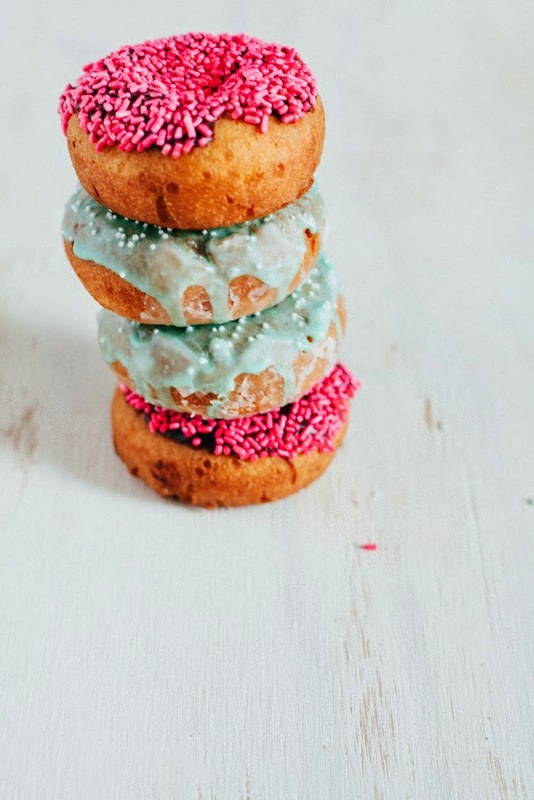 Pretty pretty donuts! All your pics last week on twitter/instagram gave me a mega craving for a proper donut - I might just have to give this frying thing a go rather than just sticking with my trusty donut pan. Your tip about using a skilled is genius! There were some free donuts in SF but nothing as good as these, or the donuts that I'll be having TOMORROW when I hit Portland! With Car Rental 8 you can get affordable car hires from over 50000 international locations.